TEKVOX announced 4K card upgrades for its popular TekFlex-32 matrix switcher whose design replaces inputs and outputs with slots. With no limitations to the number of inputs and outputs or the type of connection, TekFlex-32 gives users the power to pick the input and output cards they need and plug them into whatever slot they choose. Now, their options have expanded with the addition of 4K HDBaseT and audio cards for the unit. The new 4K HDBaseT cards support 100m (330 feet) distance. TekFlex-32 comes with 24 card slots with flexible input/output combinations and 8 fixed output card slots. Comprehensive signal card compatibility includes HDMI, DVI, SDI, VGA and HDBaseT. 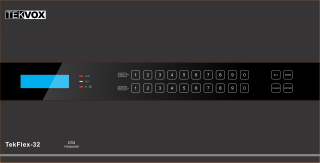 The switcher offers powerful EDID management, a web-based GUI and controllable front panel buttons (IR, RS232 ad TCP/IP).